A new series of ready-made, unscripted, authentic listening materials, which feature native and nonnative speakers. Created by Sheila Thorn of THE LISTENING BUSINESS these materials train, rather than just test, the students in listening. They boost students' confidence in their listening skills by exposing them to authentic texts, and introduce the learner to the grammatical structures and lexis which are used most frequently in spoken English. The materials also help students deal with those aspects of informal spoken English which they find so challenging, e.g. assimilation, elision, linking and colloquial expressions. Each topic in the series is at 3 levels (Elementary, Intermediate and Advanced) and has a book with a CD, and includes 5 interviews (different interviews at every level), each followed by detailed comprehension and language practice exercises which can be used in the classroom or for self-study. 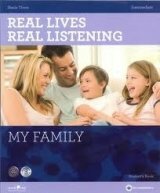 The series reflects the latest academic theories on the importance of authentic listening practice in language acquisition. The series also shows our new awareness of the huge differences between spoken and written English highlighted by recent research on spoken English corpora. Forthcoming titles are listed below, and the series will feature over 100 native and near-fluent non-native English speakers from all the main regions of Britain, as well as Australia, Canada, the USA, South Africa, Africa, China, Czech Republic, France, Germany, Greece, Italy, Japan, The Netherlands, Norway, Russia, South Korea, Sweden and Turkey. The books come with a free CD, transcripts and glossaries. Teachers' notes are free on line, containing classroom support and background notes.